In 2006, the last election in which both a governor and a U.S. senator were being elected, turnout was 48.6 percent. In 2002, turnout statewide was 51.8 percent. Experts are predicting a lower number. The 23 percent turnout in February broke the previous record low of 25 percent in 1978 and 2006 Illinois State Board of Elections officials are predicting turnout levels to be similar to recent gubernatorial election years. “Voter turnout in the last six contests for governor has been stable,” Executive Director Dan White said. That can either be good or bad, depending. 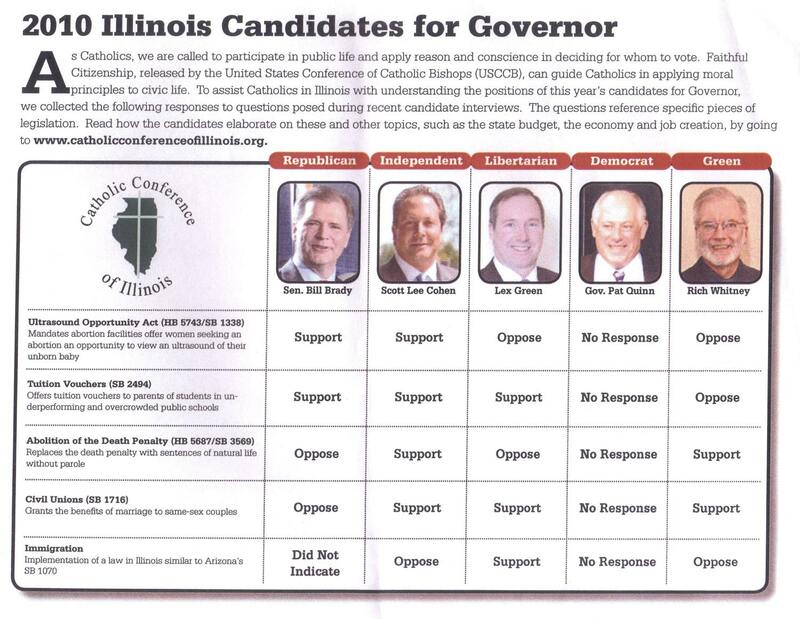 If Quinn had filled it out, he’d be on the opposite side of the Catholic Conference on three huge issues - abortion, vouchers and civil unions - and everyone would know it. By not filling it out, though, he disses the largest, most powerful religious organization in the state. The business community can’t sit by while an organization purporting to represent its interests perpetrates a smear campaign against an Illinois Supreme Court Justice. The Illinois Civil Justice League is working to oust Justice Thomas Kilbride because he voted to strike down a recently enacted state law limiting damage awards in medical malpractice cases. The organization waged a long fight for malpractice caps, a goal shared by many in the state’s business community. But the Civil Justice League’s attack ads don’t talk about Justice Kilbride’s vote against caps. Apparently the group doesn’t think the issue will motivate folks to come out and vote against him. Instead, the organization slurs him with the baseless charge that he’s soft on crime, an allegation much more likely to rile voters. Television commercials paid for by its political action committee falsely cast Justice Kilbride as a protector of criminals. Kilbride’s latest campaign piece includes the image of an elephant (the GOP logo) and the words, “Election Alert for Republicans.” He then goes on to reference “we” multiple times, as if to suggest he is a Republican. At 6 o’clock, you’d think they’d want as many people as possible out at L stops and polling places, and making phone calls and knocking on doors. Bill Brady’s party won’t open the doors to his attendees until 7:30 Tuesday night, according to a press release. Protected: SUBSCRIBERS ONLY: Dirty Democratic Halloween tricks? [McCook Police Chief Frank Wolfe] said that an officer about 11:15 p.m. Saturday spotted a white van leaving the home of an 83-year-old woman, who doesn’t drive, on the 8400 block of Joliet Road. When it failed to use a turn signal, it was stopped, he said. The officer noticed a Tobolski sign at the woman’s home had been destroyed, and Peraica was a passenger in the vehicle, Wolfe said. While the officer talked to Peraica, the owner of a building about a block away said someone had similarly vandalized a sign on his property, the site of a restaurant, the chief said. One of the building owner’s tenants then told police he saw Peraica get out of the van and vandalize the sign at the restaurant, Wolfe said. Peraica was arrested, charged with criminal damage to property and released early Sunday morning pending a Nov. 22 court date. Peraica said the episode was directed by Tobolski and that the mayor made calls to the police station while Peraica was being held. Peraica said some officers were apologetic about the arrest. “They were incredulous that they were being told what to do. Clearly the mayor was directing the whole show,” he said. Peraica said he was riding in a volunteer’s van and that a McCook squad car began following it almost as soon as it entered the town. He said the volunteer posted some signs on public property but that police pulled over the van after a few minutes. After being pulled over in Stickney for tearing down opponent Jeff Tobolski’s campaign signs a call went out to local police for suspicious behavior of a white chevy mini van. McCook police caught Tony Peraica red handed on an elderly woman’s private property with a broken Jeff Tobolski campaign sign. If the Stickney cops back up the McCook police chief, Peraica is in big trouble, man. *** UPDATE 1 *** I just got off the phone with McCook Police Chief Frank Wolfe. Wolfe says that a Stickney officer on patrol last night heard a person yell something like “Hey, cut it out! What’re you doing?” and observed a white Chevy van and a person entering the van with a pole in his hand. The Stickney officer, according to the McCook chief (who has since spoken with Stickney police), gave the man a verbal warning and then apparently put the event on the radio. Chief Wolfe said his officers heard the warning and shortly thereafter saw a white Chevy van backing out of a private residence. When the van failed to use its signal, the McCook police stopped the van. The occupants claimed they were posting Peraica signs, but there were no such signs in the area, according to the chief. One of the officers then noticed that a Tobolski sign had been vandalized at the house where the van had been parked. According to the chief, the yard sign was strongly reinforced. That’s where the pole comes in. Apparently, they were using the pole to knock down the signs. The owner of a business a block or so away then approached the police, Chief Wolfe said, and claimed that somebody destroyed two signs on his property and said that his tenant was a witness. The tenant was quickly brought to the scene and, according to Chief Wolfe, the tenant identified Peraica, who was then arrested. 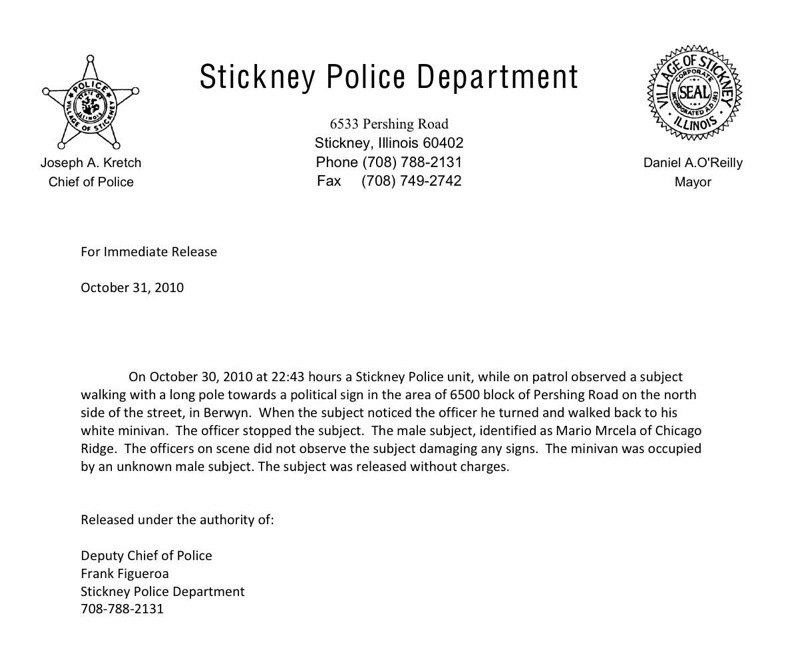 On October 30, 2010 at 22:43 hours a Stickney Police unit, while on patrol observed a subject walking with a long pole towards a political sign in the area of 6500 block of Pershing Road on the north side of the street, in Berwyn. When the subject noticed the officer he turned and walked back to his white minivan. The officer stopped the subject. The male subject, identified as Mario Mrcela of Chicago Ridge. The officers on scene did not observe the subject damaging any signs. The minivan was occupied by an unknown male subject. The subject was released without charges. This all seems to fit. Peraica is claiming he wasn’t doing anything wrong and was set up by the McCook coppers, but it surely doesn’t look good for him right now. When passing through McCook at about 11 PM, on our way to Willow Springs, a marked McCook police car almost immediately began to follow us as we were going south on Joliet Road. We were followed for about half mile, pulled over without reason given and harassed. Police searched the vehicle, found nothing, and were about to let us continue. Then, a police sergeant came to the scene followed by another, third police car, with a male wearing only jeans who pointed to me and alleged that I caused criminal damage to his property –a cardboard sign. This apparently inebriated male, who was barefoot and without any clothes above waist, proceeded to say that he saw me damage his cardboard sign. None of this is remotely true. I never even got out of the van. The arresting officer was apologetic but was ordered to do this and had to follow orders. This is a blatant abuse of police authority by a desperate candidate who is using his police department to engage in political retribution just because he can. This kind of behavior has no place in our democracy. If elected officials abuse their authority like this to trump up phony charges against other elected officials, and get away with it, what will they do to an average citizen who does not have the ability to respond or fight back. I have been fighting corruption and illegal behavior for many years in Cook County and this is just another example of such behavior.